Modern web-scale data centers are thirsty for bandwidth. Popular bandwidth-intensive apps like video, virtual reality, and machine learning are causing operators to look for scalable, cost effective ways to support high-performance wireless connectivity. 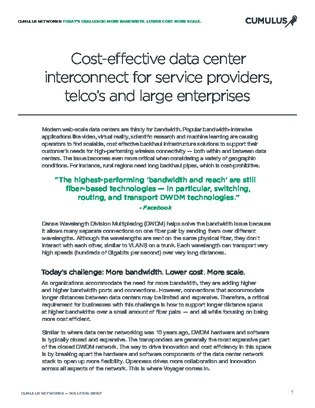 This white paper explores how to answer the demand for more bandwidth with a cost-effective approach to dense wavelength division multiplexing (DWDM). Find out how to make DWDM work for your network without breaking the bank, and learn about Voyager, the industry’s first open packet optical platform and a Broadcom Tomahawk-based switch that adds DWDM ports to connect with other switches, regardless of distance.